jasmine, originally uploaded by pilgrimgirl. 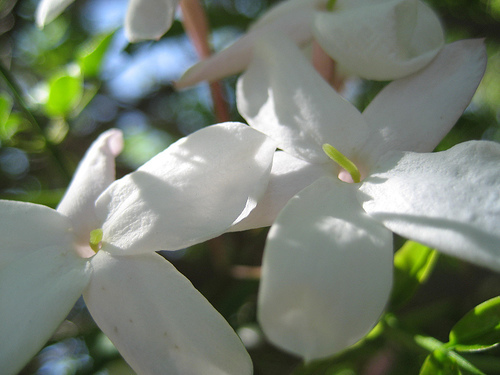 Picture: A closeup photo of two white jasmine blossoms. When I was a little girl I remember making paper cones, filling them with flowers, and hanging them on neighbors’ doorknobs. Yet I don’t think my kids have ever commemorated this particular holiday in school. What about you, do you have childhood memories of MayDay? And/Or do you still celebrate it somehow? Your photographs are wonderful. Do you mind if I ask what camera you use? Oh, and for every picture that makes it onto my flickr account or onto my website, I’ve usually taken 5-10 that don’t work out quite so well. I never actually filled baskets — when you live in the suburbs, it’s generally not a good idea to pick any flowers except dandelions — but I remember when I was about 7 or 8 making baskets from a pattern in one of my mother’s craft books. The pattern used construction paper, cut to represent a flower on each of the four sides and folded up to make a basket. They were pretty, and I wished I could put flowers in them and hang them from doorknobs the way May Day was described in the books with the romantic pictures of girls dancing around a Maypole. * May depend on the nature of your workplace. We went to the Pasadena Waldorf School to celebrate! We went to their lovely May Faire. We made flowers out of tissue paper, had a picnic, watched lovely performances. Although no maypole this year:( The Santa Monica Waldorf school will be doing one on Saturday!!! Thank you for responding! I am in the market for a digital camera right now. I was an avid photographer prior to the advent of digital cameras. I haven’t been interested in awhile, but am slowly rediscovering an interest. I am a stranger, but not a stranger. I have been following your blog and Caroline’s blog for awhile. I attended a Sunstone conference at CGU some time ago and attended a session about women LDS bloggers. During the question and answer period, I did not ask any questions, but did express some feelings about what the panel was saying. I am not a member, but have found myself surrounded by Church members. My boyfriend (of ten years) was raised lds and was in a Phd program in religious studies at CGU (with a focus on early American religions and the Church) when we attended the conference. I have always had an interest in the study of religion. I had a terrific day during the conference and especially enjoyed your session. Unfortunately my experience changed drastically during the final session, the “discussion” about DNA and the impact on Mormon beliefs. One of the speakers so offended me, I was shaking throughout most of it and for some time after. I encountered John when I approached the journalist on the panel who had written a relevant article in the LA Times. I’ve gone on too long, but I am not a frequenter of blogs, nor am I prone to leaving comments. I guess I felt I had to tell you something about myself. Otherwise it felt strange–the anonymity of the internet…Thank you for “listening”? Thanks so much for writing about the connection from the CGU conference! As for the DNA/BOM session, I was LIVID by the end of that one, too. I can understand that whatshisface is an artist and was being dramatic and interesting with his presentation, but it was totally over the top inappropriate in that setting. It was wayyyy too long, too. Please feel free to comment anytime. It’s really a thrill for me to create a community here at my blog. Perhaps I’ll run into you again at CGU sometime! !